Both iOS and OS X operating systems feature great gestures that make it easier for users to perform different tasks. 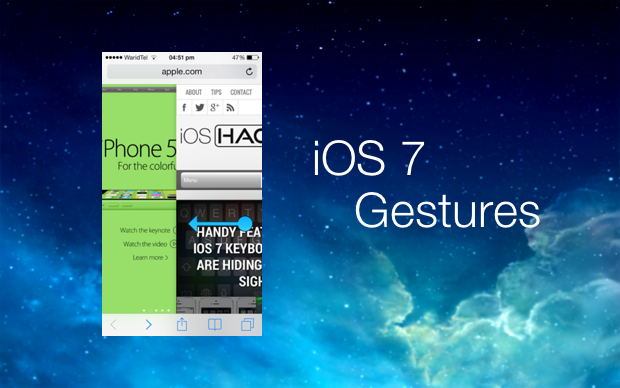 In iOS 7 Apple has improved the gestures on iOS devices making navigation a lot more faster and easier for the users. In this post we will tell you about a few awesome iOS gestures that have been added to iPhone, iPad and iPod touch in the latest update. 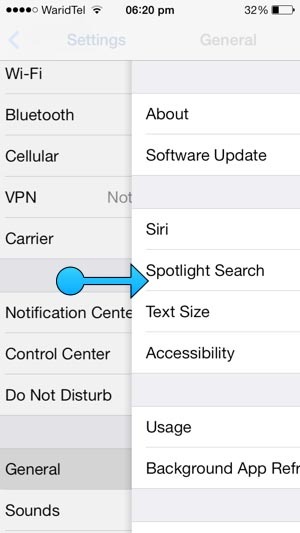 A new look and tab switching page isn’t the only change iOS 7 brings to mobile Safari browser. In the newest edition of iOS users can also go back to the previous webpage or access the next webpage simply by swiping their finger in the right direction. Of course the navigation bar at the bottom also features back and forward buttons but the swipe gestures are faster, convenient and fun to use. Also when the navigation bar disappears while you are scrolling down the gestures are the better way to go. Swipe towards Right: When you swipe towards the right side of the screen starting from the far end Safari will take you back to the previous webpage you visited. 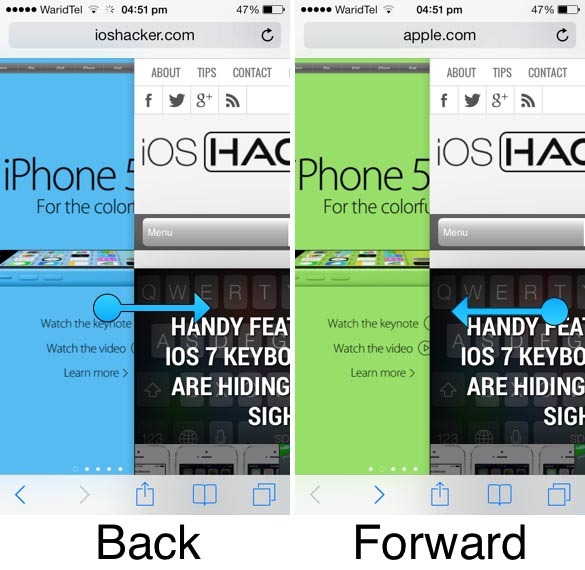 Swipe towards Left: When you swipe towards the left side Safari will take you to the forward webpage. 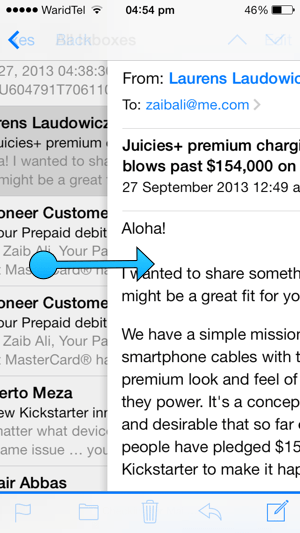 Just like Safari users can also navigate to previous screen in Messages and Mail applications. In order to do so just swipe towards the right side from the corner of the screen. Doing this will reveal the lists in both stock applications. This method of going back to previous page is much better then tap on the back button. Not only in Messages and Mail apps but the back gesture also works in Settings application. Just like mentioned above you can go from one page to another simple by swiping your way through in Settings apps. 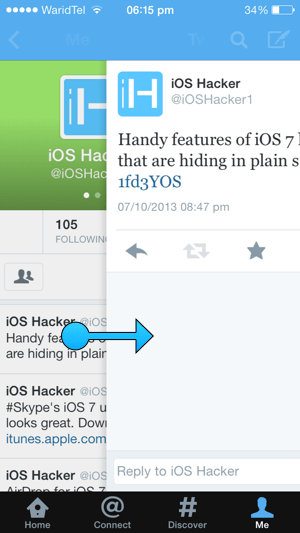 This swipe gesture for going back also works in other parts of iOS as well. It will work pretty much everywhere in stock apps and pages where there’s a similar option to go back to the previous page. We have told you about the back gesture in stock applications above. If you like this simple way of going back to previous page like this then you will be glad to know that many third party applications that have been updated with iOS 7 support also feature this functionality. For example on official Twitter app you can easily go back to the previous screen by performing the same gesture. Go ahead and give it a try.